Hamilton County Schools officials and administrators will meet this week with nearly 200 prospective teacher candidates as the district works to fill positions. As of Friday, more than 190 participants had pre-registered for Monday's recruitment fair, with administrators, teachers and principals from at least 50 of the district's 79 schools slated to attend, said Erin Harrell, recruitment and field experience coordinator for Hamilton County Schools. But while administrators are planning ahead for recruiting next year's teachers, 16 Hamilton County classroom positions are currently vacant, just days before winter break. Though those 16 classrooms are not teacherless — they are most commonly staffed by a long-term substitute teacher — these mid-year vacancies highlight the challenges the district faces in recruiting, hiring and retaining teachers. The current vacancies have either been vacant since the beginning of the school year or the teacher has left since the first day of school. The Hamilton County Schools Recruitment Fair will be held Monday at 5:30 p.m. at East Ridge Elementary School. To learn more and register, visit HCDE’s recruitment site or teachchattanooga.org. The issue isn't unique to Hamilton County; Knox County Schools currently has 46 vacancies. Most commonly cited reasons for the "teacher shortage" facing Hamilton County and the state as a whole include a decreasing number of graduates from teacher preparation programs, low compensation and burnout. "We felt the squeeze this summer for highly qualified candidates," Harrell said. "This is something we are seeing across the state." Regardless of current vacancies, the district needs to hire between 250 and 300 teachers for the next school year. Though this number is on-trend with year-to-year hiring in a district with almost 3,000 teachers, the number of applicants and possible candidates is the biggest concern for recruiters. Statewide, the number of teachers graduating from teacher preparation programs at local universities is dropping. 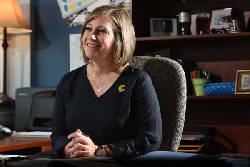 "Since 2013, we've seen a decline in enrollment of student-teachers of at least 10 to 15 percent," said Renee Murley, director of the University of Tennessee at Chattanooga's School of Education. In 2014, UTC's School of Education graduated 234 licensed teachers. In 2015, that number dropped to 165. Statewide, Murley noted a similar trend. "In those same years, the state of Tennessee had 4,211 [licensed graduates]," Murley said. "In 2014-2015, there were 3,833." Recruiters note certain areas of high concern in terms of a shortage: special education, secondary math and science, and ELL or bilingual teachers. "The numbers in special education overall is dropping," Murley said. "We are seeing an overall decline in teachers, and across the state and across the country." Harrell also notes that the county hopes to recruit more males and teachers of color. This school year, 77.5 percent of Hamilton County teachers are women and 86.9 precent of teachers are white. Often, schools with the highest needs also have the most positions that need to be filled. Of the 16 current vacancies, nine of them are in the Opportunity Zone, which includes 12 of the district's most struggling schools. The zone includes schools in the Brainerd High and the Howard School feeder patterns, some of the highest-needs areas in the school district. "Obviously, this is a problem we have to fix," said Jill Levine, chief of the Opportunity Zone. Superintendent Bryan Johnson launched the Opportunity Zone in August, named a new leadership team and provided more staff, targeted support and a heightened urgency for improvement. Because of the high needs of student populations, some of these schools struggle with retention or recruitment more than others in the district. "Particularly in these schools, these are teachers who are not only teaching math and reading, but are buying coats for these kids, providing breakfast, walking them home from school," Levine said. "Teachers provide a lot of these things without even thinking about it the burnout rate can often be very high." Research shows teachers are most likely to leave the profession within three years. Of UTC's graduates, about 60 percent are hired by Hamilton County Schools, Murley said. Last year, 93.2 percent of UTC's teachers hired in a Tennessee public school continued to teach after their first year. However in 2016, in an effort to bolster teacher prepartion programs statewide, the state also launched a new report card for training programs to give insight into new teachers' readiness for the classroom. UTC scored a 2 out of 4, but Murley joined the school earlier that year and has been implementing changes to improve the school's training of future teachers as well as working directly with the district to fulfill some of its specific needs. In Hamilton County, schools retained more than 91 percent of staff at the end of the year, Harrell said. Of current staff this year, 649 are eligible to retire. However, Harrell is confident the district is moving forward with a greater focus on recruitment. "Carmen Carson and I are now both working on recruitment, up from one individual last year," Harrell said. "We have a comprehensive plan to recruit all across the Southeast, especially for high-need subject areas, for Opportunity Zone schools, and to increase our number of teachers of color in [Hamilton County Department of Education]." In June, Harrell joined the district as the new recruitment and fieldwork coordinator. 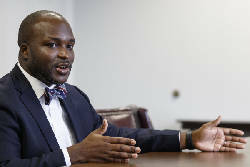 Harrell previously worked for Project Inspire, a teacher residency program operated by the Public Education Foundation. The district also named Carmen Carson as recruitment coordinator specifically for the Opportunity Zone schools. Some of the district's plans for recruiting include hiring earlier (2017-2018 teacher positions will open in January), working with local university partnerships, and working with administrators at the school level. The district is looking for a new chief talent officer and is exploring ways to strengthen a teacher pipeline as far back as preparing high school students to be future teachers. The district also hopes to address compensation and benefits for teachers in the future. Mentoring and induction programs for new teachers also are on the forefront of the minds of Harrell, Levine and the district overall. "Teacher morale goes up when teachers feel successful," Levine said. "We can set them up for success." Contact staff writer Meghan Mangrum at mmangrum@timesfree press.com or 423-757-6592. Follow her on Twitter @memangrum.